The Photograph That Took the Place of a Mountain is a diverse collection of writings on the philosophy, politics, and art of photography. Its topics range from the tension between artist and model to the landscapes of the American West, the surfaces of a second-hand New York City, and the predicament of transcultural photography. 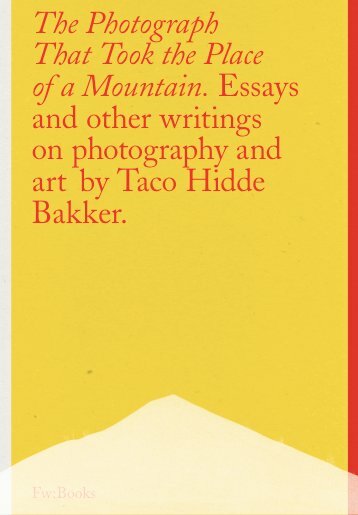 Taco Hidde Bakker has selected and revised sixteen pieces of writing from a variety of publications spanning the past decade of his journeys through photography and art. In addition, Bakker has written four new pieces for this volume. Often engaging in close collaboration with the artists about whose work he writes, Bakker explores different literary forms in response to their views. The recurring reference to poetry informs the productive friction between images and the words that accrue around them. The Photograph That Took the Place of a Mountain contains writings about artists such as Witho Worms, Onorato & Krebs, Dirk Braeckman, Renato D’Agostin, Tom Callemin, Mariken Wessels, Ken Schles, Stephan Keppel, and Francesca Woodman.